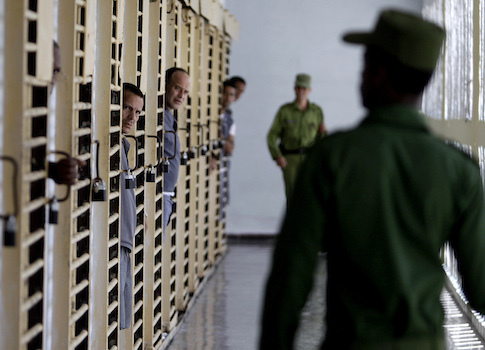 A recent wave of governmental threats and attacks on Cuban journalists has led to heightened concern among human rights and press freedom advocates. Last week, Cuban journalist Roberto de Jesús Guerra Pérez alleged that on June 11 a government agent beat him as he waited outside the Czech Republic embassy in Havana to connect to the Internet. "An unknown man intercepted and attacked Guerra without warning, punching and kicking him in his head and face, and leaving him with a broken nose, as well as cuts, scrapes, and bruises all over his body," according to the Human Rights Foundation (HRF). Guerra is the founder of Centro de Informacion Hablemos Press (CIHPRESS), an online news site critical of the Cuban Government that frequently publishes stories on the affronts its reporters encounter. Roberto Gonzalez, a legal associate with HRF, was in contact with Guerra following the beating. Gonzalez told the Washington Free Beacon Guerra had gone to the police and filed a complaint after the event. Gonzalez said Guerra identified the man who beat him outside the embassy as a state agent. Four others on two motorcycles showed up during the thrashing—one urging the assailant to cease. According to Gonzalez, the aggressor finally stopped, then told Guerra, "This is so you know what we do to dissidents." Guerra had received various threats of violence over the phone the day leading up to the incident and many times before, Gonzalez said. Because the alleged assault involves a state agent Guerra’s formal complaint to police will likely go untouched. On the day of the assault, CIHPRESS published an article regarding three of its journalists, including Guerra, whose phones had been blocked by the state-owned cellular service provider ETECSA as part of a campaign against members of the island’s media who criticize the government. Through the phone service, customers pay to load their phones with minutes, which are frequently depleted, rendering an essential tool for journalists very expensive, Gonzalez said. On June 8, CIHPRESS correspondent Magaly Norvis Otero and Guerra’s wife were called to the police station in Havana where they were told CIHPRESS must change the tone of its writings or there would be consequences, according to HRF. The constant threats of censorship, surveillance, imprisonment, and physical harm among many others make being a journalist in Cuba a very difficult job, said Carlos Lauría, senior program coordinator at the Committee to Protect Journalists Americas, a press-freedom advocacy group. Lauría said chasing stories about topics the Cuban government does not want reported requires great courage and commitment. Lauría has spoken with Guerra and other reporters from CIHPRESS in the past regarding similar situations, but reaching journalists in Cuba can be difficult, he said, because calls are frequently blocked or intercepted.